We can help you find the sociobiology books you are looking for. As the world's largest independent marketplace for new, used and rare books, you always get the best in service and value when you buy from Biblio.com, and all of your purchases are backed by our return guarantee. Ablex Publishing Co. As New with no dust jacket. 1984. First Edition. Hardcover. 0893910597 . New inside; light marks on the fore-edge. ; Modern Sociology Series; 191 pages . New York: Harper & Row, 1979. Hardcover. Very good condition in good d.j./good. 274pp. 24 cm. Elsevier. Very Good in Very Good dust jacket. 1977. First Edition; First Printing. Hardcover. 0444990291 . Nice clean copy ; 378 pages . University Park, PA: Pennsylvania State U.P., 1992. First Edition. Hardcover. New. Size=6"x9". (full book description) Pennsylvania State U.P., University Park, PA, 1992. 1st Edition NEW, Hard Cover, w/Dust Jacket. Size=6"x9", 238pp(Index). It's NEW!! NO ink names, DJ tears etc. It is a NEW copy. 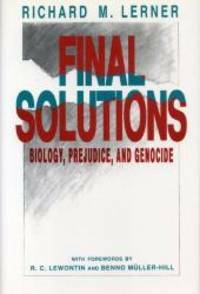 ISBN 0271007931 [National Socialism; Sociobiology; Social Policy; New Book] SELLING WORLDWIDE SINCE 1987. WE ALWAYS PACK WITH GREAT CARE! Columbus, OH: Ohio State University Press, 1976. Hardcover. 1st edition, 1st printing. 261 pp. Bibliography. Index. Fine book (no markings) / Fine dust jacket (price not clipped). A clean, fresh copy. Westview Press. Very Good with no dust jacket. 1980. First Paperback Edition; First Printing. Softcover. 0891589600 . X-library. Nice clean copy ; 627 pages . Newcastle upon Tyne, UK: Cambridge Scholars Publishing, 2015. Trade Paperback. New. "Biohistory examines how a complex interplay between culture and biology has shaped civilisations from the Roman Empire to the modern West." [from publisher] Includes illustrations, maps, bibliographical references, and index. Transaction Books. New in Near Fine dust jacket. 1997. Hardcover. 1560003723 . In new mylar cover; 151 pages .